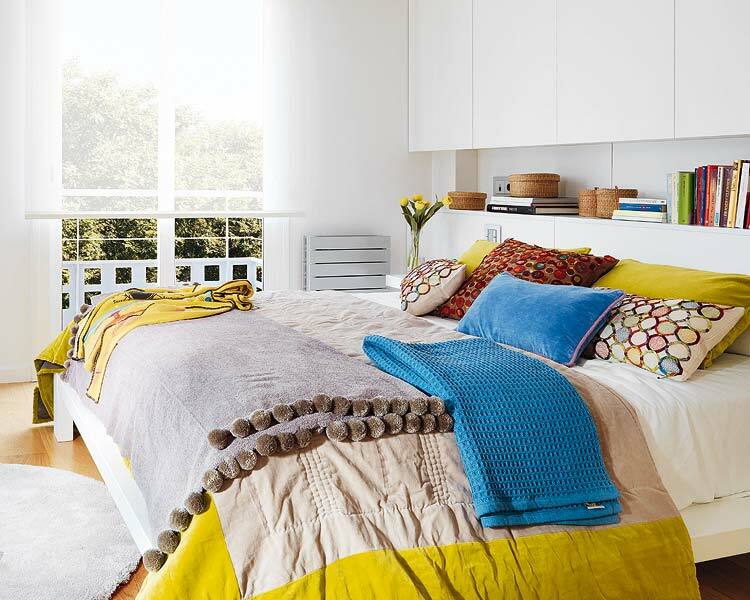 Mix and Chic: Home tour- Small space, big style! Today, I am featuring a small one bedroom home. Living in a small space can be a challenge. However, with some smart storage ideas, right scale furniture and a cohesive paint color throughout the home, it can make any small space feels more spacious. Let's take a cue from this chic and modern home below for some stylish new ideas. Have you noticed the amount of storage spaces in this home? There is the built-in niches for books, a wall of cabinets above the bed and a wall of storage area behind the glass sliding door in the kitchen. Now, that is smart storage. 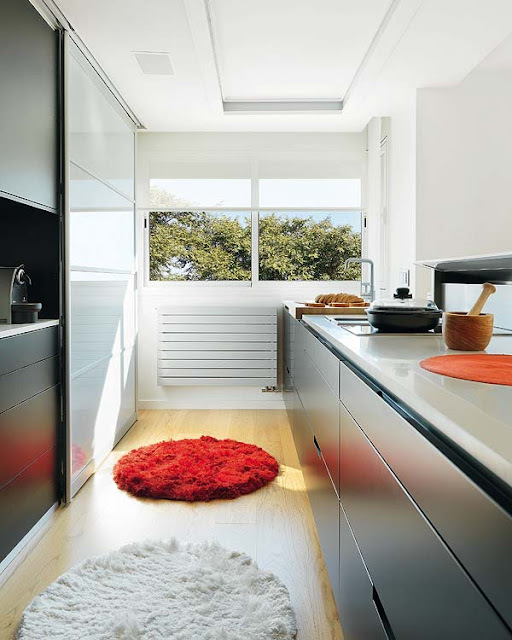 Thinking and planning ahead are especially important in small homes to maximize spaces and to avoid clutter. Also, there are not much huge furniture to clutter the visual, thus tricking the eye that the space seems larger than it is. With white painted walls throughout the house, it reflects light and flows from one room to the other seamlessly without "breaking up" the space. To jazz up a space, simply incorporate a few colorful accents using some decorative home accessories such a few pretty toss pillows, a whimsical area rug and an artwork or two for some style. Sometimes when you have a small space you are challenged to only have things you really love and keep things in order...or it can go the other way around and it could look super cluttered. In this case, it look perfection as there is storage around and things are kept where they belong. I love that purple paint on the bathroom...I guess waking up and going to that bathroom in the morning would only boost your energy level and make you quite happy! Beautiful things come in small packages right? 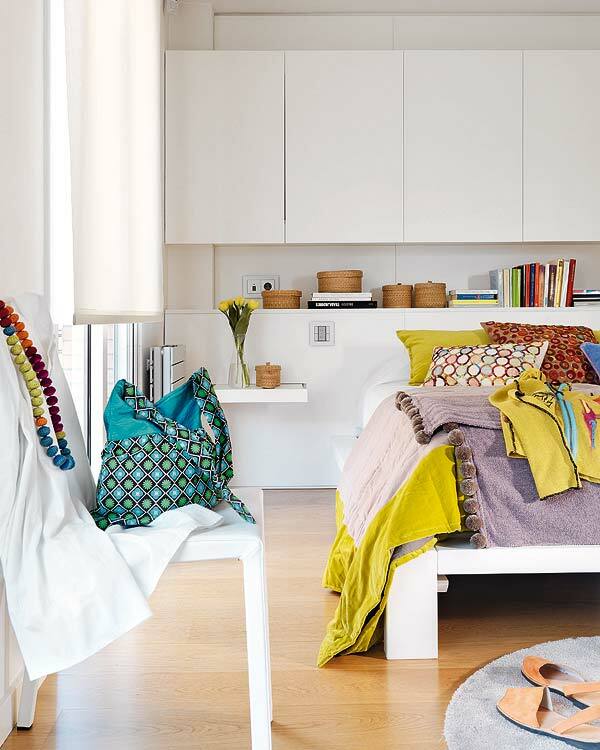 This is beautifully done, love all the white with the pops of color, its such a happy space. 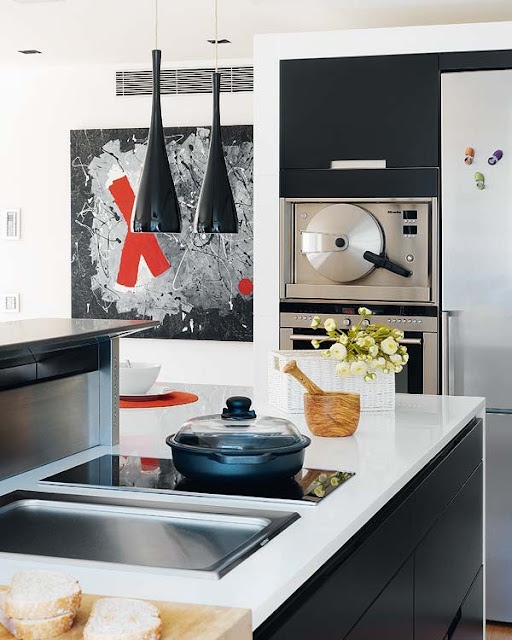 Great kitchen, love the orange in the bathroom..its a really neat place. Ok so this place completely puts my teeny tiny postage stamp house to shame! I am dying over that view! And is that a space age microwave I spy in the kitchen, I can't work it out? Whatever it is, I WANT it! Can we talk about how I LOVE the uses of the yellow and that fabulous orange wall in the bathroom. LOVE! It would be impossible not to be happy in this house! I love seeing examples of how people utilize small spaces! I love how they incorporated so much storage and you are so right they made it look much bigger than it is! Oh my! I love home tours of small spaces, it really shows how creative and genius people are with utilizing their space. The niches for books is fabulous ;) What a great home!!! 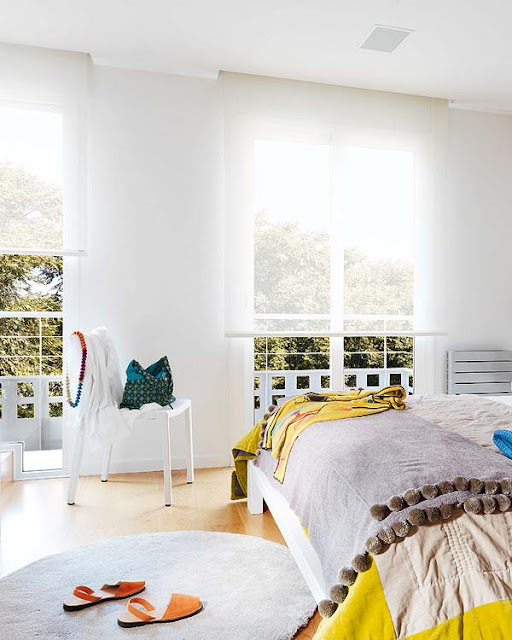 Sometimes white can seem so sparse, but there is so much color added in in small doses that this space feels both restful and energetic, all at once! I am particularly crazy about the throw on the bed with what appears to be faux-fur pompoms on it. To die. This is such a great design work into a small space. I love how the furnitures are positioned in the room. I love this home!!! i love white. 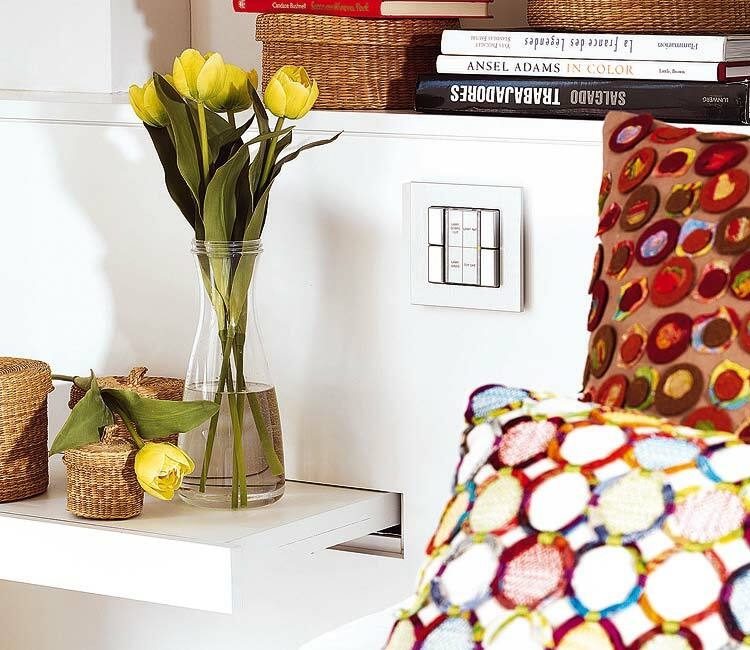 so clean and pretty and its brought up even more and better with the pops of color in the details of the home. I love how you described the home :) perfect. how funny all white and bam! 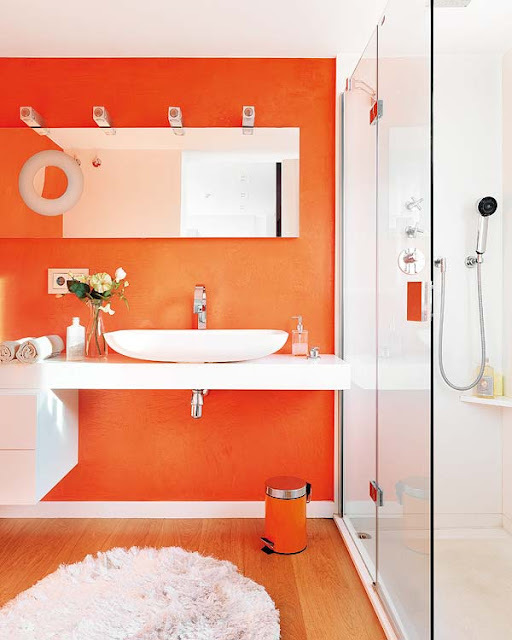 an orange bathroom.